Unlike Miraculous Shine which devolves the top stage of every evolution Pokemon, Stellar Reign only devolves the active Pokemon. Gardevoir GX is the only Stage 2 Pokemon that is currently having any tournament success. Stellar Reign relies on Psychic energy (not colorless like Espeon EX). If a Stage 2 Pokemon was evolved through Rare Candy (Sun & Moon, 129/149), Miraculous Shine will send it back to its Basic state, just like Stellar Reign. Granted, Gardevoir GX, at the time of writing, stands as the most popular and successful deck in the format right now, I can’t even begin to argue with that, but overall, Shining Jirachi just isn’t going to be as valuable as Miraculous Shine in most scenarios. While this Pokemon could have significant impact on Active Pokemon in spread decks, I just don’t think it’s nearly as versatile as Espeon EX, and I don’t even use Espeon EX in my spread decks – my preference is Meowstic (Generations, RC15). I have only seen Shining Jirachi once, and my records show that I won that match, but I honestly don’t even remember it, so I doubt that it had much of an impact on the game. Today, we’re looking at Shining Jirachi from the Shining Legends expansion. 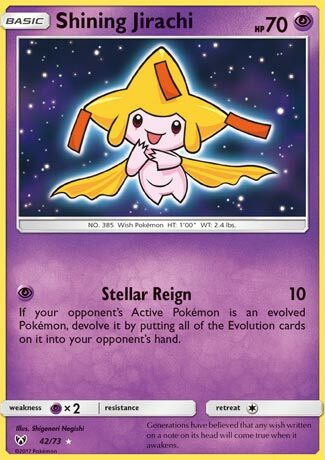 The name of the card means you could have up to four of Jirachi and four of Shining Jirachi in your deck. This one is a Psychic type with 70 HP, weak to Psychic, and a retreat of one. It’s only attack, Stellar Reign, costs P and does 10 damage, with the effect that if the Defending Pokémon is an evolved Pokémon, it will be devolved down to the Basic Pokémon. Yes, that means all stages of evolution will be removed. Stage 1? Remove one stage from that Pokémon. Stage 2? Remove two stages of that Pokémon! Break Evolution of a Stage 2?! Remove THREE stages of evolution from that Pokémon! Stage 1 Pokémon may be able to get away by re-evolving their Pokémon back, but Stage 2 onwards will have to spend a turn or two to get back to their stage if the player does not use Rare Candy. Most Stage 2 Pokémon has Basic Pokémon around 30-70 HP, so strategies involving placing damage counters via ability are the way to go. Some actions that may come to mind is one use of Giant Water Shuriken before manually retreating Greninja BREAK to bring Jirachi in front (70 damage: one Giant Water Shuriken plus Steller Reign’s 10 damage). You could have four Decidueye-GX on the Bench spamming Feather Arrows totaling 80 damage, which is enough to take out evolving basics that have their Stage 2 evolutions. Some evolving basics that are easier to take out with such strategies include Froakie (XY Breakpoint), Rowlet (Sun & Moon), Beldum (SM Guardians Rising), Ralts (SM Burning Shadows) and Alolan Vulpix (SM Guardians Rising). Unfortunately, Basic EX Pokémon with their Mega Evolutions have considerably higher HP such that devolving that stage won’t knock out the Pokémon anytime sooner. Overall, devolution is another viable strategy that sets back your opponent’s setup, especially when they used Rare Candy to skip the Stage 1. The opponent will actually have to search for their Stage 1 to get there. What would’ve been better for Shining Jirachi is if the energy cost is colorless. Because the attack needs a Psychic energy, you need to have room for Basic Psychic Energies or Rainbow Energies to make up for that cost. This has potential for Standard and Expanded. In Limited, as long as you keep spamming Stellar Reign, your opponent will NEVER get to put their Stage 2 down. However, there are some good basic Pokémon or Stage 1 Pokémon that has no trouble handling Shining Jirachi such as the Outrage Bros. (Reshiram & Zekrom), Raichu-GX, or Zoroark-GX. Hello again, dear readers! Today we’ll be looking at a very peculiar card that takes on a very interesting spin on a very powerful anti-meta technique currently present. And the card that takes on that mantle is none other than a Shiny Jirachi! Our BL-tiered Lele counter here takes on its Psychic typing in this rendition. It has 70 HP, is a Basic Pokemon, and is weak to Psychic, just like the Psychic and Poison types that are converted to cards do. A retreat cost of 1 is convenient, as Jirachi’s main and only move costs 1 energy, so it is pretty mobile. But what about the attack? Stellar Reign costs 1 Psychic energy and deals 10 damage. Quite sub-par, yes, but the damage is just the cherry on top of a very disruptive effect. Because what it did is that it fully devolves the opponent’s Active Pokemon, all the way from even their Stage 2 forms. And does a Pokemon that can do a similar job existed in the meta? Of course, its Espeon-EX (XY BKT) with its Miraculous Shine move! So it is a must that we compare the two. Like Espeon-EX, Jirachi can be placed as a surprise tech; it means that you can just drop it, put an energy on it and switch into it as the new Active Pokemon. Both are Psychic types and has a 1 retreat cost. But there does exist some differences between the two; Miraculous Shine costs 1 Colorless energy, making its usage as a tech in snipe decks much easier, and it devolves all the opponent’s evolved Pokemon, including the benched ones. However, Espeon only devolves them by one stage, which means Pokemon that evolves manually can have a chance of surviving the HP loss. But Jirachi is different; at the cost of having to use a colored energy, such as basic Psychic/Rainbow energy and only being to devolve the opposing Active, so you need to drag the target to the Active slot first, you can strip them to their Basic form immediately. A good example is with Metagross decks, which Jirachi shouldn’t be able to touch; you let them take the full damage first, then just use Jirachi to strip the Metagross all the way to a Beldum and only having 60 HP, and not only they lose the Metagross, they also will lose the momentum. Although some might say that losing 2 Pokemon is better than losing 1 Pokemon, but the effect is the same nonetheless. All in all, Jirachi is a very solid 1-prize devolver in the meta and can be included as a 1 or 2-off(s) in decks that run Rainbow or basic Psychic energy to help the matchups against powerful Stage 2 Pokemon, and I think it will see moderate play. The Embryo makes its debut. Not to copy someone though. Shining Jirachi (Shining Legends 42/73) opens our week, as we take some time to look at the Pokémon that almost made our Top 5 list for Shining Legends. Shining Jirachi is a Basic, Psychic-Type Pokémon with 70 HP, Psychic Weakness, no Resistance, Retreat Cost [C] and the attack “Stellar Rain” that does 10 damage and allows you to devolve your opponent’s Pokémon down to its lowest Stage of Evolution. Even though the set is named after them, none of the new Shining Pokémon broke the Top 5; explaining the mechanic in detail gets a bit complicated because the powers-that-be love partial recycling. For more on Shining Pokémon in the TCG, including their long history and variations, check out this separate article (link pending). There are no other Shining Jirachi cards in the Pokémon TCG, so no direct competition for deck space. Being a Basic is still the best, as it means a minimal time and resource commitment. The Psychic-Typing is relevant for Weakness/Resistance interactions and because other Psychic-Energy requiring Psychic-Types will work at least a tiny bit better with Shining Jirachi than not; it doesn’t really get too much from Psychic-Type support. 70 HP is a highly probable OHKO while Active or when faced with a focused Bench hit; at least it isn’t going to make for an easy secondary KO from attacks that hit multiple targets and makes it Level Ball legal (something that might matter, this time). The low HP almost makes the Psychic Weakness a non-issue, but Psychic-Types tend to be a bit odd in the damage department; attacks that scale their damage, or hit for low damage but with a potent additional effect are their calling card. Lack of Resistance is typical, and wouldn’t help much even if present due to the HP. The Retreat Cost of [C] isn’t perfect, but it is close; most of the time, Shining Jirachi should be able to easily retreat even without extra help. So the stats on Shining Jirachi aren’t impressive, what about the effects? Shining Jirachi has just one attack, so either its pretty amazing, it ties in with a combo, or we really overrated the card. Stellar Reign is a devolution based attack, and devolving your opponent’s Pokémon is rarely powerful in and of itself as the designers usually have the Evolution cards return to the opponent’s hand… so your opponent can just re-Evolve the next turn. With it being an attack effect, I can’t recall any hand disruption you can combo with Stellar Reign to prevent your opponent from just Evolving again, and with Archeops (BW: Noble Victories 67/101; BW: Dark Explorers 110/108) banned, the remaining Evolution-lock is also a no go because it is in attack form. Devolving isn’t optional, so you risk helping your opponent if it allows him or her to reuse a coming-into-play Ability. With the “bad” out of the way, I can now explain the “good” of the attack. While Stellar Reign only Devolves your opponent’s Active, it does so completely; even if it is the BREAK Evolution of a Stage 2 that Evolved from a Stage 1 that Evolved from a Basic Pokémon, it gets busted all the way back down to Basic. So not only do you have the usual benefit of giving something that Evolved via Rare Candy a significant setback but anything that has Evolved more than once as well. Another easily overlooked aspect is that this is one of the few Devolution attacks which does damage. It is only 10 damage, so on its own, it will never cause something to Devolve enough to be KO’d, but 10 base damage allows you to use card effects that increase damage. It isn’t “broken”, but it just might be enough for this to become competitive. How? The card is still pretty new, and I’ve been busy and thus not on the PTCGO as much. I haven’t encountered any Shining Jirachi decks, but I can give you the ideas I’ve had for such a deck, as well as the general principles most (all?) such decks should follow. The easiest is to just find a deck with a source of [P] Energy it can spare for Shining Jirachi, and use Shining Jirachi as TecH. Even better if such a deck already has a strong element of damage spread. Just remember, Devolving a Pokémon-GX into its Basic Stage will only gain you a single Prize, and Shining Jirachi is probably getting KO’d after it attacks. There are enough prominent Evolutions that one may be able to build an entire deck around Shining Jirachi. Here, it is probably best to focus on effects that boost damage alongside some that place damage counters; Special Conditions do NOT count, as the act of Devolving will remove them (just like Evolving). Due to when Devolution happens, Choice Band will still provide its damage bonus against Pokémon-EX/GX. If you are able to spare your Supporter for the turn, Professor Kukui is much appreciated. Too often, that still won’t be enough, so something like Golbat (XY: Phantom Forces 32/119; Generations 31/83) is in order. That also means Devolution Spray, so you may reliably reuse its Ability a few times. You’ll want something useful against mostly or mono-Basic decks as well; perhaps Jolteon-EX? Espeon-EX is also another good partner; quite a few times when Devolving multiple Pokémon once is more important than Devolving one Pokémon multiple times. The Expanded Format provides additional combo partners and counters; it also seems to have more mostly or mono-Basic decks. I’m going to score it as if they broke even, but I warn you I’m being a bit optimistic in doing so. Shining Legends didn’t get a Pre-Release to my knowledge since it is the “bonus” expansion for the year, separate from the SM-series of quarterly releases. I’m not sure if you can legally run it in a Limited Format event; if you can, it will probably be pricey as the booster packs are only available as part of gift sets. We’ve been scoring for the Limited Format anyway, so I’ll point out that with decks built from what you pull, in a slower format, as long as your opponent wasn’t blessed/cursed with a mostly Basic Pokémon deck, Shining Jirachi should have the chance to take a key KO, even if something else has to damage the target by attacking the turn before. Not a huge chance, but enough that I’d try to include it if it wasn’t too demanding. Shining Jirachi is a combo centerpiece, but without such support, it remains a nifty trick for certain decks. The net result is a card that is good, but definitely not too good. It is also metagame sensitive; if we see a shift back to a mostly Basic Pokémon format, or if Shining Jirachi had released when Mega Evolutions ruled the Earth, it would rarely be worth the effort, even as TecH. If Psychic Weak, Evolved Pokémon-GX like Espeon-GX become big again, Shining Jirachi with a Choice Band becomes an easy trade. If we had done a Top 10 for Shining Legends, Shining Jirachi would have been our 6th place finisher, as it earned 14 voting points by placing fourth on two of the five individual top pick lists. I thought I would have seen more of it by now; perhaps I had it a bit high. Some of my lower picks look to show more promise, especially after SM: Crimson Invasion becomes tournament legal. Previous articleNew Yugioh Products coming this Holiday Season!